This website has been recommended by Charles, a reader of this blog. 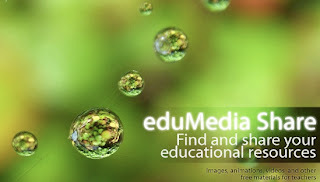 EduMedia Share is a kind of Youtube especially aimed at science teachers. Any teacher may signup to upload science related videos and other multimedia files. It recognizes many file types including gif, jpg and png for images, avi, mpg, mov and wmv for movies and flash for animations. If you have multimedia content prepared by you for your own classroom, why not share it with the rest of the world! The site already contains files in the field of physics (including mechanics and optics) and biology, however it is lacking files in other fields of science. If you are teaching the properties of light, the site already contains a lot of files on that topic. Also, any teacher may access any file uploaded on the website freely for use in their classroom. As the database grows, this website may become a "must" to show multimedia content to your students. Some experiments are just not feasible in elementary and secondary school laboratories. In that case, a video may be reasonable replacement. The search for videos is based on tags, which may sometimes make it hard for people who prefer to use a directory to find the files. A quick note for Mac users : the site works best with Firefox and Camino. It is difficult to use it with Safari.